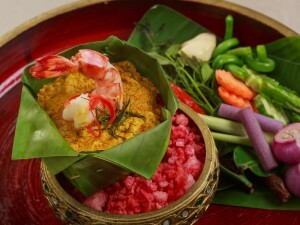 Eat your way through the Bangkok night! Smiling Albino’s Bangkok Headlights tour is one of our most famous excursions. Since we started it in 1999, this dynamic evening out has been wowing our guests, showing them the best of Bangkok after dark at street level. It hits the city’s unique transportation, people, sights, hidden alleys and secret party spots – and most especially, the food! What makes the Headlights tour such a great experience for foodies is that the itinerary is extremely flexible, depending on the interests and curiosities of the guests. 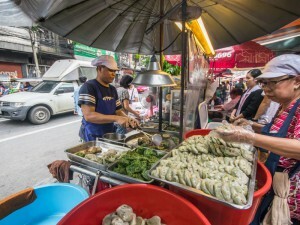 Combine this with the fact that food in Bangkok covers the gamut from none-to-five stars, is extremely affordable, easy to order even if you don’t speak Thai, and – despite the often overly-sensitive Western views on cleanliness – hygienic. With the amazing variety of culinary options in Bangkok, you can be sure that no two Headlights trips are ever the same twice. Most of our Headlights trips start out on lower Sukhumvit Road, and right away we’re into a whole galaxy of food choices. One of our favorite areas to explore is soi 3/1, also known as Little Arabia, where Bangkok’s vibrant African/Middle Eastern communities serve up some of the best food in the city. A sit-down meal isn’t usually on the menu right off the bat, so sometimes we’ll stop at our favorite shawarma stand for an appetizer. There are many of these little spots to choose from, but we prefer the guy by the telephone booth who infuses his shawarma with spicy sauces, rather than just drizzles them on top. It’s the little things that count. 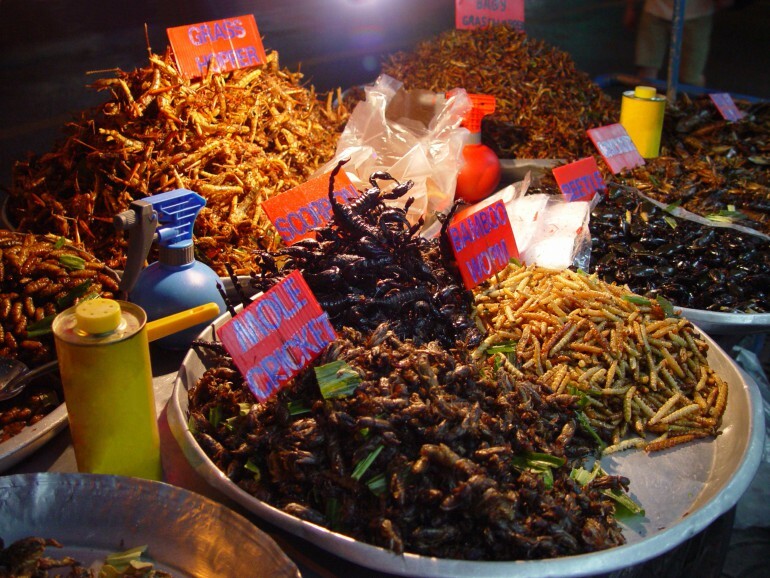 Some guests are up for something a bit more challenging to start, so we can also take a diversion through the Nana red light district, where we’re sure to find someone selling fried grasshoppers, mealworms, and even the odd scorpion from their mobile stalls. Insects have a bad aftertaste, you say? No problem – there’s a guy just down the street who sells dondurma, the famously sticky Turkish ice cream. Of course, as consummate hosts, we cater to our guest’s wishes. Those who’d rather avoid the chaos that buzzes around a red light district can follow us to our favorite rooftop bar, Sirocco, on the 63rd floor of State Tower for a sunset cocktail. You probably know it from the Hangover part 2 movie, and it never fails to impress – the view here is stunning. If this is the route we take, dinner often follows in one of our favorite back-alley eating areas nearby. The narrow streets behind State Tower are busy with diners chowing down at their favorite stalls, as the smells of meat, noodles, and unknown spices waft around you. Tender roast duck and a damn fine version of northern Thailand’s famous dish khao soi gai are among the favorites. When guests express a desire to have their entire evening revolve around street food, there’s only one place to end up – Chinatown. Also known as Yaowarat, it’s a long street absolutely stuffed with food. 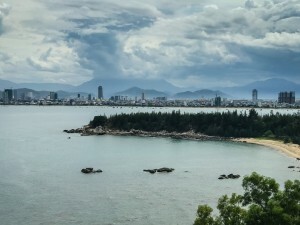 Barbecued pork, steaming noodles, rice porridge, sticky desserts doused in iced milk, hot kettles of ginger tea, glutinous bird’s nest soup, and heaping plates of curried crab are just some of the dishes that spring to mind – and that’s just on the main road! Yaowarat is also home to dozens of little streets that wind away into old, crowded neighborhoods where you can find even more exceptional treats. Not in the mood for street food? Not a problem. 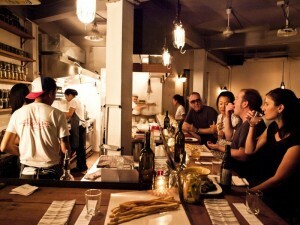 Bangkok is also home to some of the world’s best restaurants if our guests feel like a more upscale dining experience. You can try out the insanely creative flavors at Gaggan (we can help you get a reservation), test your tolerance for spicy Thai cuisine at Bo.lan, or sip imported tequila while tucking into genuine Tex-Mex at La Monita. If that doesn’t convince you, may we recommend you watch this episode of Long Krung, hosted by Smiling Albino’s very own Daniel Fraser. Watch as he and Smiling Albino’s co-founder Scott Coates head out to literally eat all night long. Join one of our adventures in Asia here!